Don’t let all the fancy electronics on this dryer fool you; behind all the glitz and glam and beep-beeps of the fancy-pants electronics, it’s still just a dumb dryer and it does the bidness of drying clothes like even the simplest (and more reliable) dryers out there. If you’re dealing with a problem where the lights come on and the controls seem awake but the motor won’t run, sure, it may be a problem with the control board or the motor relay. But take a look at the highlighted motor circuit in the schematic below. What else do you see in the motor power circuit? Well, there’s some pretty dang simple stuff like the door switch, belt switch, and the thermal fuse. If any one of these is open, you’re gonna have a dead motor situation. You feel me? 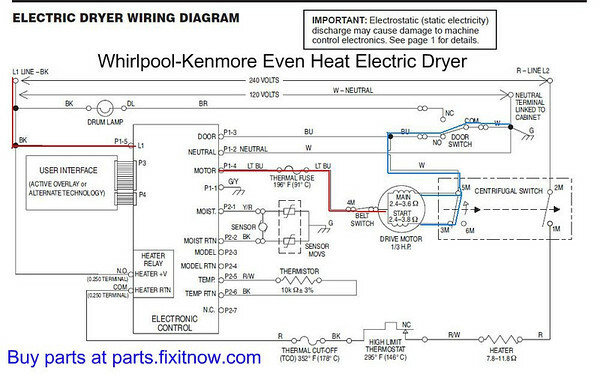 This entry was posted in Dryer Repair, Wiring Diagrams and Schematics and tagged dryer, Even Heat, Whirlpool on September 22, 2010 by Samurai Appliance Repair Man.